If there is a better way to say “elegance” than with an outdoor stone fountain. These sculpted beauties have the ability to take your breath away. If you want to make an impression on your next guest, friend, family member, or business, consider the option of an outdoor stone fountain. These are crafted with quality in mind. This type of water feature is available in several finishes, so you can select the natural color that best matches your garden or home. Get your hands on one of these fascinating products today. Can An Outdoor Stone Fountain Work For Me? Yes, it certainly can. 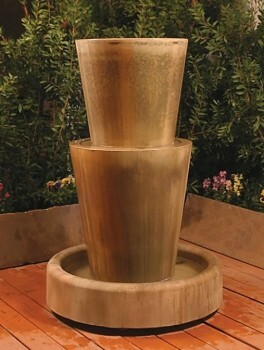 One of the most intriguing options is the Double Oblique Outdoor Stone Fountain. This piece is charming and timeless, sure to be there to help you create a lifetime of memories. This solid and elegant water feature is built from glass fiber and reinforced concrete and is sure to last for many years. The pump also includes a one-year warranty. A beautiful fountain such as this is bound to be a crowd pleaser. If you are deciding on a fountain for your outdoor pleasure, you probably need to consider the climate where you live. Do you live in a warmer region? Or, is it more likely to be cooler? Are you prone to receiving rough weather conditions? All of these factors can determine what type of fountain you ultimately decide upon. There are several different types of seasonal fountains to choose from. Some people might opt for the kind of fountain that must be shut down in the winter months if you live in a colder climate. Otherwise the water could freeze up and cause some damage to the product. The most popular type of seasonal fountain is a waterfall. These look absolutely stunning as the water cascades down the stones or steps. They function in the same way others do: by cycling the water through the fountain. 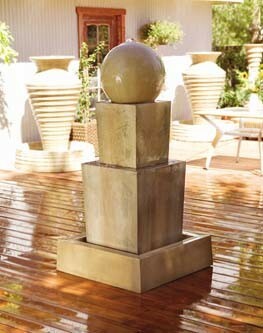 Another lovely kind of seasonal fountain is the pedestal. These outdoor fountains resemble bird baths, but cycle water through like a fountain. They likely will have several layers or steps for the water to tumble down on as it cascades to the basin. These are a perfect, classy alternative to the more traditional bird bath. It is possible that birds will still flutter to this outdoor fountain, but that is not the main function of this product. Are There Any Outdoor Fountains Suited For Year-Round Use? Year round outdoor-made fountains are those that are heated and can be left running in the winter months. There are two major types of these kinds of products: solar and electric. It depends on what your outdoor situation is. Do you live in an area that receives ample sunlight? If not, you might want to consider the electrical option. Either way, you’ll want to be sure you are well aware of your environment. Don’t wait to see all that www.watergallery.net has for you today!